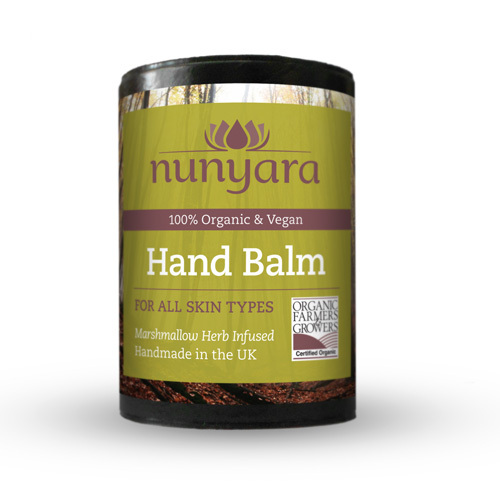 This hand salve is designed for everyday use. The Marshmallow herb infusion has been identified for its high levels of mucilage. This substance (also found in Aloe) is very soothing and calming on the skin. This salve is wonderful for anyone as well as those suffering with eczema, psoriasis or other skin complaints. Deep lavender fragrance with an earthy background scent. Apply a small amount to the hands and massage in, it is a balm so a little goes a long way. Store in a cooler place if the balm is a little too soft. Ingredients; Olea europaea (Olive oil)*, Carthamus tinctorius (Safflower oil)*, Theobroma cacao (Cocoa butter)*, Copernicia cerifera (Carnauba wax)*, Althea officinale (Marshmallow root)*, Lavandula angustifolia oil (Lavender oil)*, Geraniol**, Limonene**, Linalool**. * Organic ingredients, ** Naturally occur in organic essential oils. This Product is Vegan Friendly! As Always Totally 100% organic. Easily recyclable glass jar and cardboard tube.